Cardona’s best work, every piece fluid and quick, yet determined to probe the aching absence and locate the reassurance that remains. Language is a major ingredient of her alchemy for immortality. Life in Suspension is a love song, a hymn to goodness and beauty. Winner of the 2017 Best Book Award in Poetry, the 2017 International Book Award in Poetry, the Pinnacle Book Award for Best Bilingual Poetry Book, and the Readers’ Favorite Award in Poetry. Finalist for the 2018 Eric Hoffer Book Award, the 2016 Lascaux Prize in Collected Poetry and the Julie Suk Award. 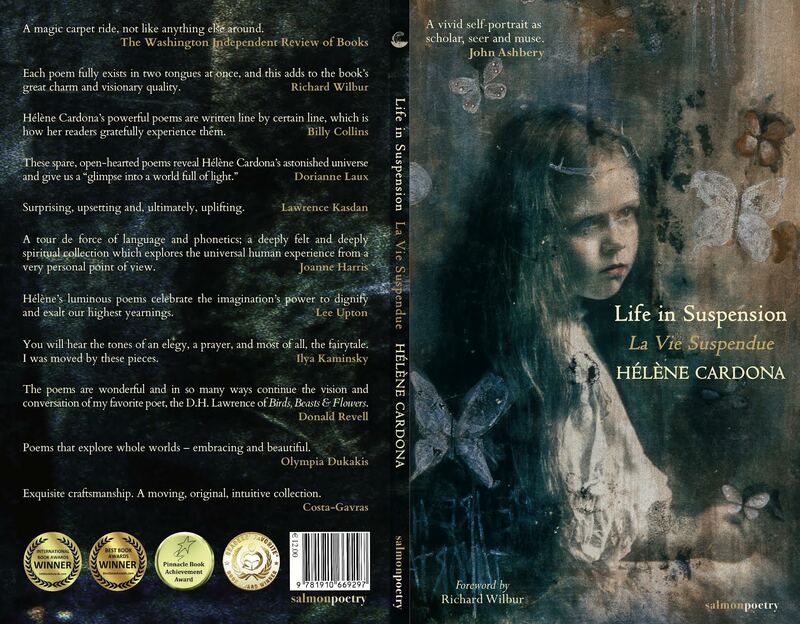 One of the most remarkable things about this remarkable book is its utter strangeness…. Not the confessional “I,” not the “I” of personal expression, not even, finally, the mythic “I,” but an explosive secular mysticism is what this book is after. At times it leaves us—deliberately—almost breathless, no longer quite “alive” but not dead either: la vie suspendue. drawn on the ashes of ancient sacrifices. 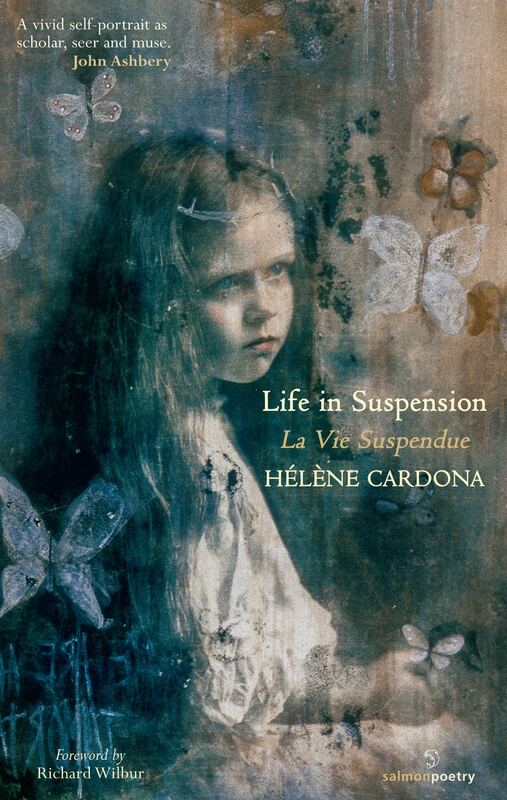 Hélène Cardona has delivered to us a book in which she celebrates the magic of parallel worlds. Two languages, two persons, one testimony. Not so much a disclosure of truth, as much as the revelation of doubt. What sways above the emptiness is a life lived in complete awe. Cardona balances over a cosmos of fragments. The sparkling, the reflections do not throw back a perfect mirror image. Lives are shared, not possessed. The result is a song for the acceptance of doubleness, pluralism. Hélène Cardona provides synthesis for what is inevitably separated. Traces of melancholy, flashes of resilience and above all, an abundance of wonder – at things both quotidian and cosmic, past and present – shine through Life in Suspension. A magical collection of poetry that will enrich the reader. Profound in thought, assured in tone, it artfully makes references to several great minds of the East and the West – Rumi and Hafiz, E. E. Cummings and Carl Sagan. The poems which move me most twist time and like the best esquisses and in a few lines tell a story. Read Hélène Cardona’s “In Search of Benevolent Immortality”. Mysterious but also so familiar, especially to anyone who has crossed borders. Subscribe to Hélène Cardona's newsletter to hear first about events and publications.